Editor's Note: Drew Minock, who co-wrote this piece, is an elementary teacher, co-founder of the popular education blog Two Guys and Some IPads, and is one of the voices on "The Two Guys Show" podcast. Imagine living in the magical world of Harry Potter, where the school hallways are lined with paintings that are alive and interactive. Now imagine creating an atmosphere like that for your students. 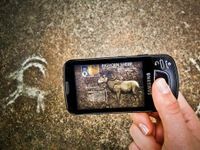 Augmented Reality (AR) allows educators and students to do just that: unlock or create layers of digital information on top of the physical world that can be viewed through an Android or iOS device. Most people who interact with AR for the first time have a mind-blowing experience but fail to consider classroom applications. In our elementary school classrooms, we use AR to create active learning experiences hitherto inconceivable, and in the process redefine the learning space! Educators know that learning deepens, not just through reading and listening, but also through creating and interacting. With Augmented Reality products like Elements 4D by Daqri, students manipulate and combine elements -- like mercury -- right from their Android or iOS devices, rather than just reading about them in a textbook. Anatomy 4D is another free app by Daqri that allows users to explore a human body and isolate various body systems. 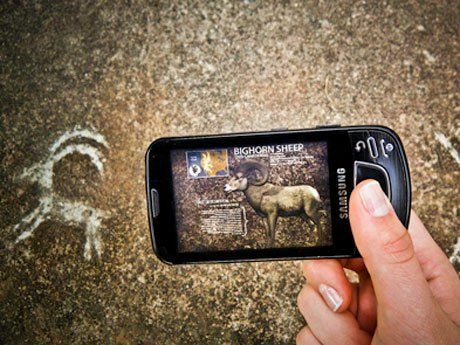 Another app, Aurasma, allows users to engage in and create Augmented Reality experiences of their own. Educators and (more importantly) students can use this open source tool to essentially bring their learning to life. We've seen Aurasma used several different ways in the classroom. Homework Mini-Lessons: When students scan a page of their homework, the page reveals a video of their teacher helping them solve a problem. Faculty Photo Wall: Set up a display of faculty photos near the school entrance. Visitors can scan the image of any instructor and see that figure come to life, telling more about him- or herself. Book Reviews: Students record themselves giving a brief review of a novel that they just finished, and then attach that "aura" (assigned digital information) to a book. Afterward, anyone can scan the cover of the book and instantly access the review. Parent Involvement: Record parents giving brief words of encouragement to their child, and attach a trigger image to every child's desk. Anytime students need to hear encouraging words from their parent, they can scan the image on their desk for virtual inspiration. Yearbooks: From tributes to video profiles, from sports highlights to skits and concert footage, the ways that AR can enhance a school yearbook are limitless. Lab Safety: Put triggers (images that activate media when scanned by an AR-enabled device) all around a science laboratory so that when students scan them, they can quickly learn the different safety procedures and protocols for the lab equipment. Deaf and Hard of Hearing (DHH) Sign Language Flashcards: With AR, flashcards of vocabulary words can contain a video overlay that shows how to sign a word or phrase. There are endless ideas and possibilities for using AR. Find a longer list of ways to meaningfully integrate AR here. Start exploring with some of the many AR tools available. For example, we've used the free app, ColAR Mix, to have students fill in the app's coloring sheets, watch the pages come to life, and then compose stories based on the images they have just designed. Also check out AR Flashcards, AR Flashcards: Space, NASA Spacecraft 3D and PBS FETCH! Lunch Rush. Though it might be a buzz term in education circles, don't assume that AR is just another fad. After all, profound learning occurs when students create, share, interact and explain. AR not only changes the environment around children, it also allows kids to construct their own exciting learning worlds as small as the atom or as big as the cosmos. So don't be afraid to enter a new dimension of learning. If you'd like more information on AR, you can check out our series of AR posts at Two Guys and Some iPads or Nesloney's Adventures. Meanwhile, we’d love to hear how teachers use AR in their classrooms. Have you used AR and if so, what have you done with it? Alternatively, if you have questions, please post them. We're happy to help.